Having a baby is indeed a blissful blessing. Nothing is more rewarding then a second chance to see the world through the eyes of a child. However, if they are having a baby for the first time, they will experience that anguish feeling as they learn about their baby’s sleep patterns. That is something that keeps many parents up at night. But—it is perfectly fine! It is ok to take baby steps when learning about the eating and sleeping patterns of your baby. It is impossible to be 100% ready in the end of the day. Be patient, the more you learn about your baby sleep patterns and habits—the more grateful and happy you will feel about the beautiful art of parenting. When your baby is sleeping, you may find yourself gushing over your baby. But, you may also notice your baby trying to fight lightly in its sleep. 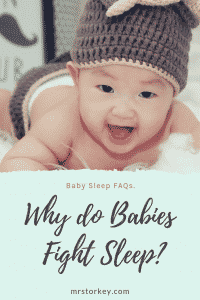 If you are wondering that why do babies fight sleep—then, it is most likely because the baby is overtired. It may have missed its routine sleep, which makes it more tired. If you keep your baby up to make sure that it would get exhausted and sleep then, you should refrain from doing it. Baby who does not sleep on time is more likely to sleep for shorter durations of time. It will also wake up consistently and fight its sleep. You should try to make your baby sleep according to its sleep window. Please also read our article: baby won’t sleep. One of our blog readers asked the question: can babies have nightmares? New parents are often concerned about their baby’s sleeping behavior, and they often wonder that if their baby is having any sort of nightmares. Babies or toddlers often tend to wake up crying at night due to hunger or, they may be having nightmares. It is actually common for babies to have nightmares. If you find your baby waking up scared at night—then, you should maybe try to coddle your baby. Or, you can move its crib to your room so it could feel safe in your presence. However, a baby is also likely to wake up crying and frightened due to stomach ache or teething. You should consult a pediatrician immediately if your baby wakes up feeling agitated or scared from its sleep. Newborn babies tend to sleep a lot. It makes the parents ponder that “is my newborn sleeping too much?” They start worrying about its sleeping patterns. Or, they may believe that baby is sleeping excessively for no reason. It could be tricky for new parents to understand, and they start looking for answers to their questions. When a baby is born, it tends to gain weight as per the diet fed to him. It is still used to sleeping in the womb, and it is trying to adjust itself to the outer world—which makes it sleep excessively. It allows the new moms and dads to sleep properly as well. A baby is more likely to sleep a lot after 2-3 weeks of its birth. However, it should wake up few times a day for its feedings. It is one of the most common questions asked by parents from the experts. If their baby starts teething—they tend to look for “do babies sleep more when teething?” online to educate themselves on it. While teething may keep the babies up at night—babies are more likely to sleep excessively during the day or night. You might also notice an increase in the duration of your baby’s sleep while it is teething. Please also read our very important article about: baby safe sleep recommendations.